Under construction! - read on at own risk! 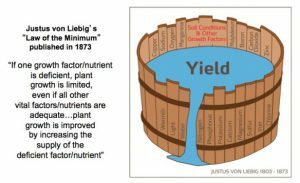 In the previous discussion we tried to define Liebig’s Law of Minimums in a way that would be of practical use to a grower. “A chain is only as strong as its weakest link” is a popular way of stating this concept. In this discussion we will expand on the application of this concept and try to determine how it can help a grower to make better decisions concerning fertility choices, while remembering that the “law of the minimum” is much more concept than law, especially when it comes to biology. Plants and animals will always try to overcome deficiencies in order to survive (and thrive if possible). Animals do this by expanding their feeding range – plants, by extending their root system. But now we will need to look at how things change as the growing season progresses. These concepts generally describe a major reality of plant growth and reproduction – a plant needs multiple mineral nutrients in varying amounts to thrive and be efficient. But beyond that, for maximum yield and quality the plant needs them in the proper ratios throughout the growing season. And, of course, the plant, soil, and weather all change as the season wears on. Yet each soil test, plant test, or observation only captures that moment in time, a bit like a ‘snapshot’, as opposed to the ‘video’ that represents the entire growing season. The closer we get to achieving this ideal, the closer we get to allowing the plant to express its full “genetic potential” (see an interesting article on genetic potential of corn here). It can be an excellent “thought aid” that helps us to work through the some of the many variables that control plant health and production. Of course genetic potential is an ideal that can never be reached, especially under typical field conditions. Many factors are out of our control, if we recognize the important limiting factors for plant growth we may achieve “practical genetic potential”. Table 1. Approximate Nutrient Requirements for Corn Based on Stage of Growth for a Yield of 180 Bushels per Acre.